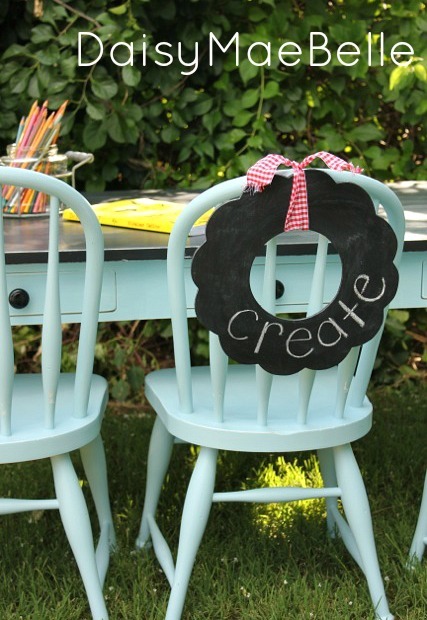 This dreamy children's aqua table and chairs plus chalkboard wreath comes with a dream in itself. Melissa aspires to have a dream workshop one day with tall ceilings, crisp white walls and creaky wood floors. 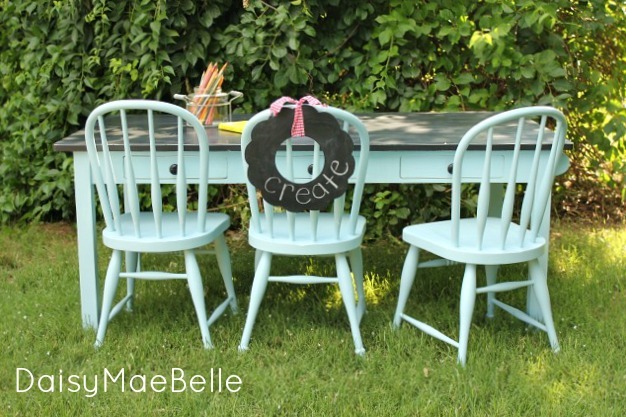 She'd drive her aqua truck covered in burlap seat covers to her little shop and create dreamy table and chair makeovers and chalkboard wreaths just like this one. I am CRAZY about this table and chairs set. The beautiful soft aqua tone is beachy as well as trendy. And the dark top and little drawer pulls offer the perfect accent. And then there's the chalkboard wreath. How genius... yes, I would sit here and create, even if it is a children's table and chairs. This is beautiful! I love the color she used.